Moist to moderate moisture. Croplands, abandoned fields, beaches, sand dunes, disturbed sites. Full or partial sun. This is an annual forb that rises from a stout, somewhat woody taproot. It can be from 8″ to 32″ tall at maturity, but in Minnesota is usually no more than 18″ in height. The stems are erect or ascending and unbranched or sparsely branched. They are almost hairless or are rough to the touch and sparsely to moderately covered with short, ascending, appressed hairs. They are often covered with resinous dots (glands). They do not have spines at the nodes. The lower leaves are alternate. The upper 2 to 6 leaves are usually alternate, sometimes opposite. 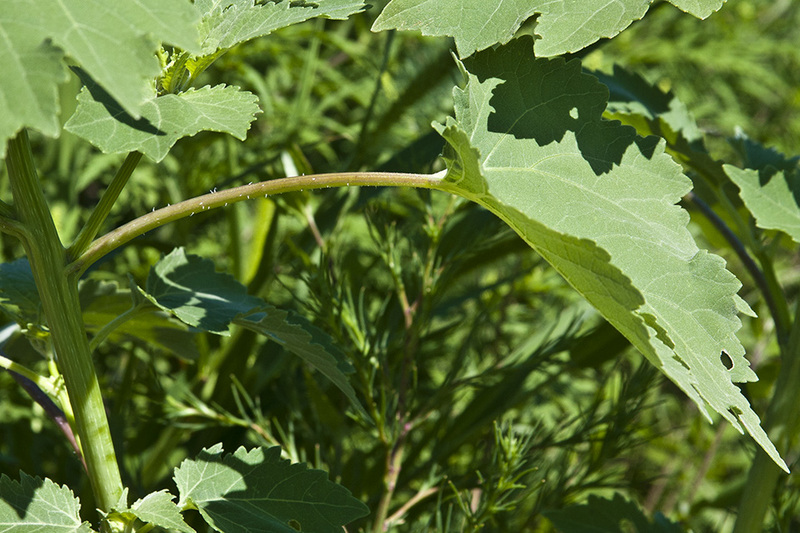 They are on ¾″ to 5″ long leaf stalks (petioles). 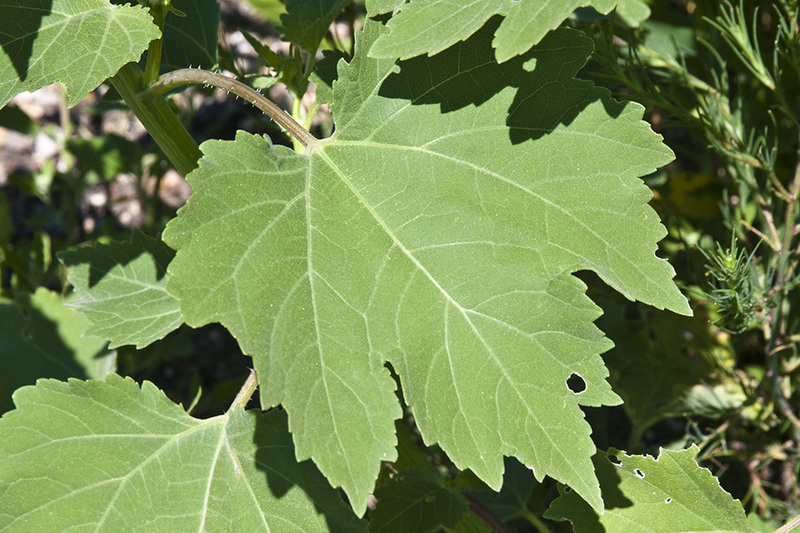 The petioles are about as long as the leaf blades. The blades are broadly egg-shaped to kidney-shaped or nearly circular, ¾″ to 7″ long, and ¾″ to 6″ wide. They are usually heart-shaped at the base and are sometimes palmately divided into 3 or 5 broad, shallow lobes. The upper and lower surfaces are rough to the touch due to short, stiff hairs. The underside is not whitened. The margins are coarsely and irregularly toothed. Male and female flowers are borne on the same plant in spikes rising from the leaf axils and at the end of the stem. The lower spikes often have all female (pistillate) flower heads, the upper ones often all male (staminate) flower heads. Most spikes have a cluster of several staminate heads at the top and sometimes 1, usually 2 to 4, pistillate heads at the base. 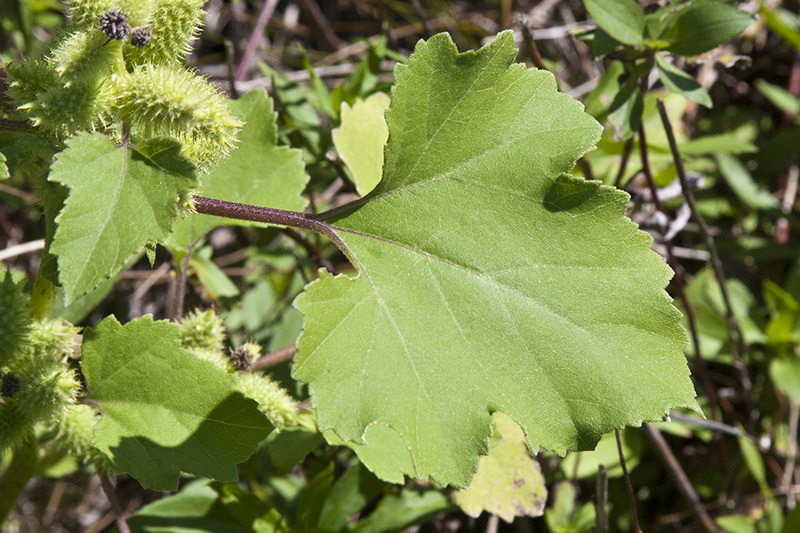 The spikes are 1″ to 4″ long, shorter than the stalk of the subtending leaf. The male flower heads are about ¼″ in diameter. They have 20 to 60 disk florets and no ray florets. The female flower head is oblong ellipse-shaped, with all but the outermost bracts of the involucre fused into a bur. 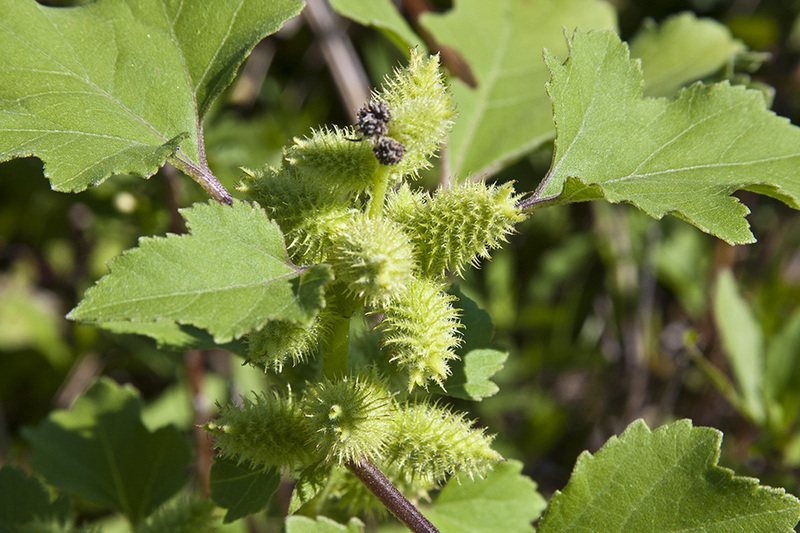 The burs are yellow-green, yellowish-brown, or brown, ⅝″ to 13 ⁄16″ long, and completely enclose the 2 female florets in separate chambers. They have 2 narrow, prolonged tips (beaks) that are hooked or curled at the top. They are covered with numerous, sharp spines that are hooked or curled at the tip. At the base of the spines there may be fine, short hairs and/or stalked or unstalked glands. 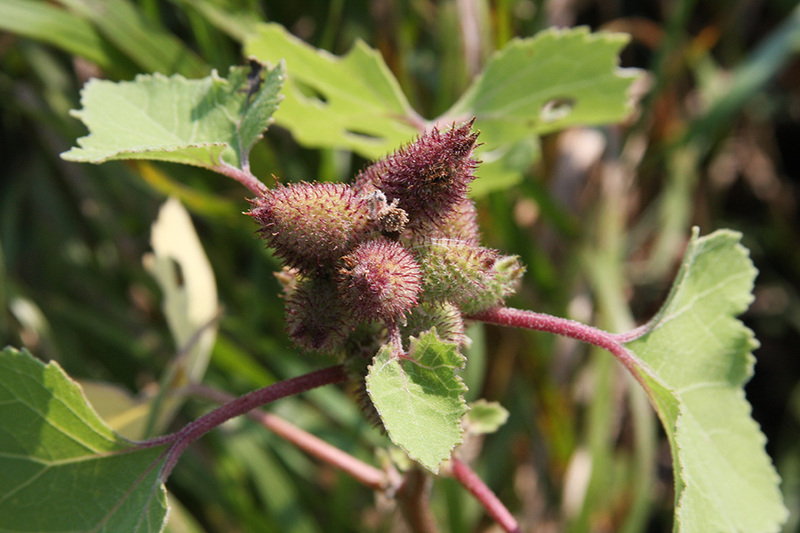 The fruit is two single-seeded capsules (achenes), one in each chamber of the bur. One seed germinates the first year, the other germinates the following year. A dry, one-chambered, single-seeded seed capsule, formed from a single carpel, with the seed attached to the membranous outer layer (wall) only by the seed stalk; the wall, formed entirely from the wall of the superior ovary, does not split open at maturity, but relies on decay or predation to release the contents. 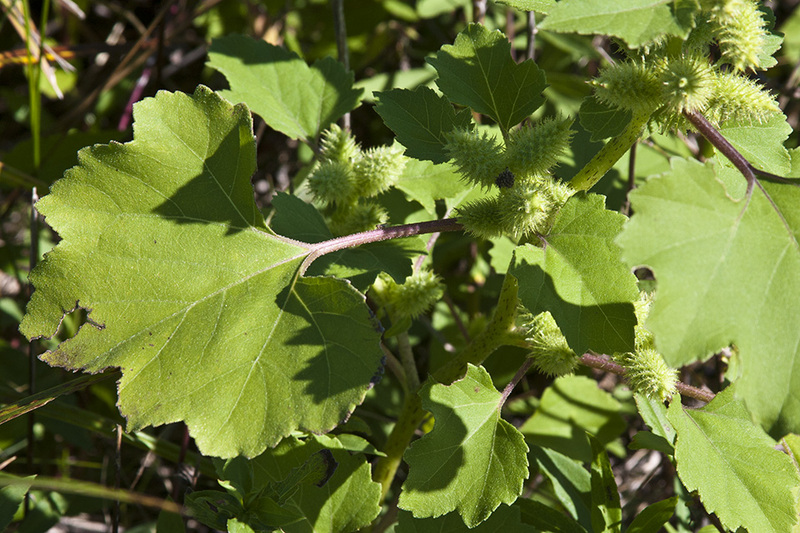 Xanthium strumarium (syn. X. canadense, X. chinense, X. glabratum, Rough Cocklebur, Clotbur, Common Cocklebur, Large Cocklebur, Woolgarie Bur) is a species of annual plants belonging to the Asteraceae family. 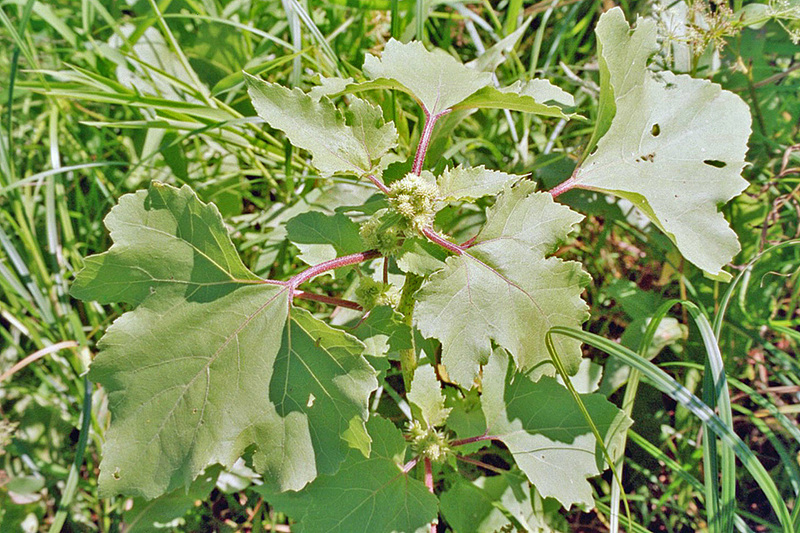 De late stekelnoot (Xanthium strumarium) is een plant in de composietenfamilie (Compositae). Weedy ground cover plants can be among the toughest plants to identify. I've been looking at this plant all over for three months now before I finally identified it based on its similarity to thornapple, a species of nightshade related to sacred datura, which I have a video of from around the time I first saw this plant. 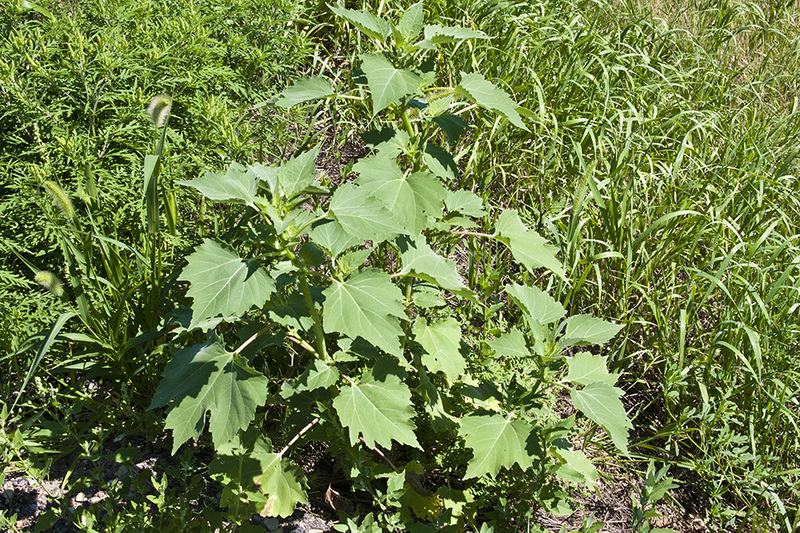 The common cocklebur (Xanthium strumarium) is noted for the prickly seed pods it produces that stick to clothing when one passes by and brushes against the plant. Common cocklebur is highly invasive and has colonized lands all around the world to the point where people are unsure as to where this plant is native to; it is thought that cocklebur is a North American native. 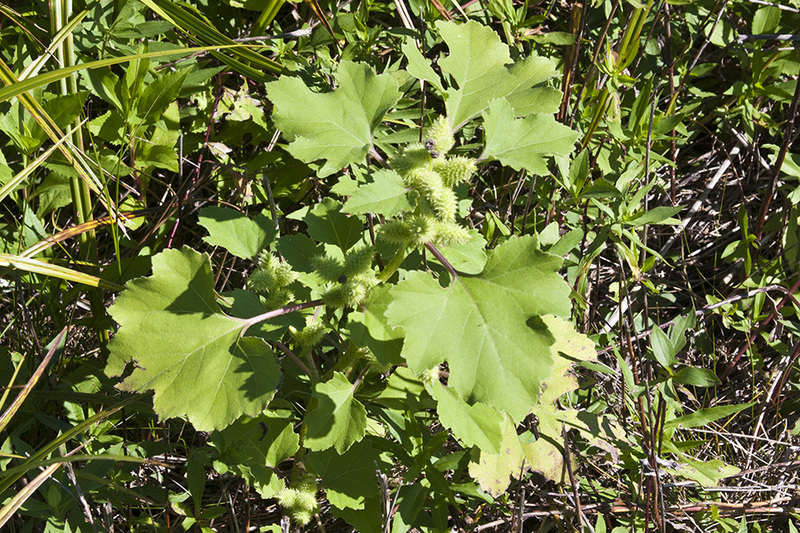 The seed pods and the seedlings are highly toxic, containing the toxin carboxyatratyloside; moreover, the entire mature plant contains at least four other toxins. Eating any part of the plant can cause sickness in small quantities, or death in large quantities. In 2007, 19 people died in Bangladesh eating this plant and four times as many people fell ill after a monsoon flood-induced starvation when there was no other vegetation available to eat (probably because everyone else ate the other plants first). Although the foliage looks decent, the thick red stems are perhaps a bad sign. This definitely isn't quite the same looking as the innocuous Yerba Mansa, but it goes to show that if you don't know your plants and mushrooms out there, you definitely do not want to eat whatever just to pass the hunger, especially since leaves and mushroom caps contain so little Caloric energy. 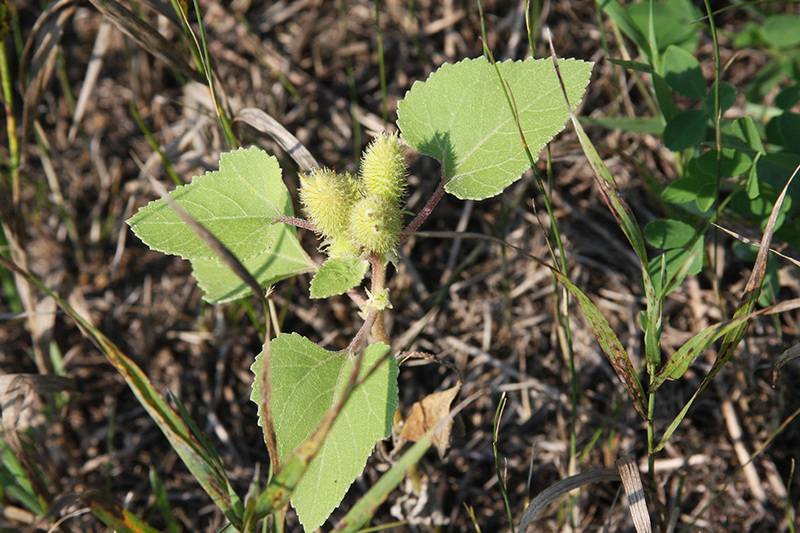 Livestock can get poisoned and die from eating this plant. 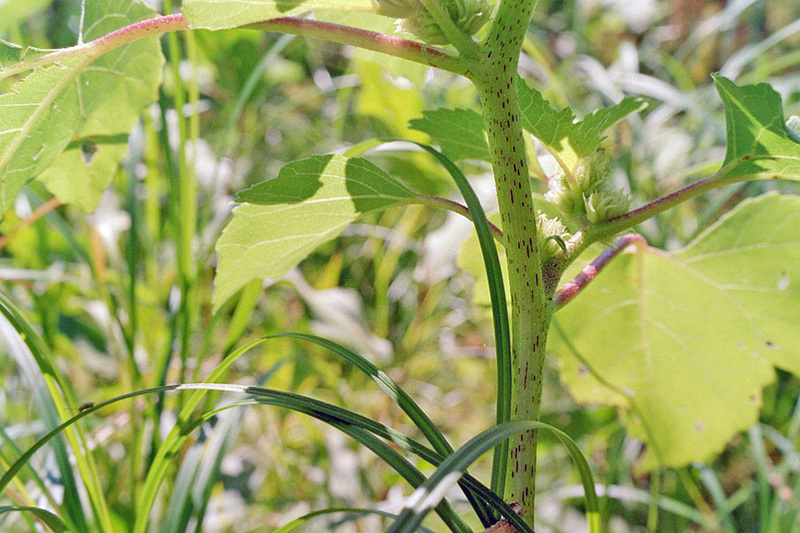 The common cocklebur can grow to over 2 meters tall to form shrubs, and has large leaves for a ground weed with 3 main branched veins in them. 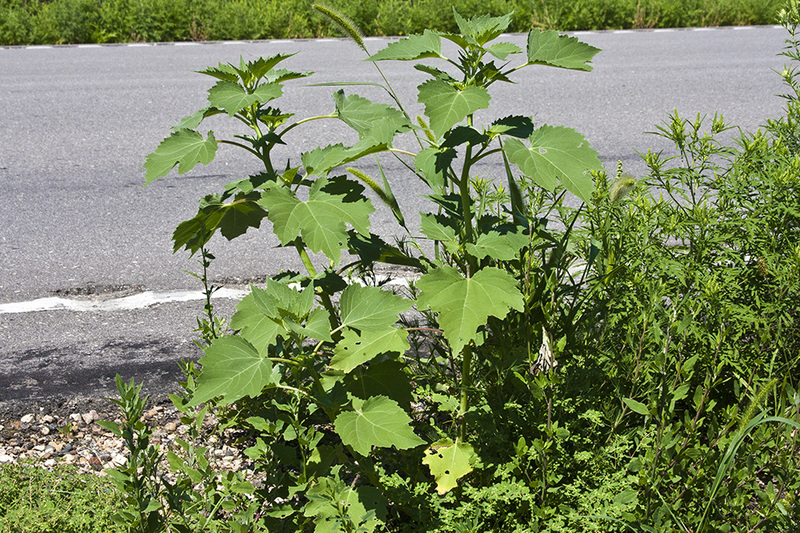 As demonstrated amply in the video, bare distrubed soil hiking trails are excellent conduits for bur dispersement, causing entire sections of trail to be flanked on both sides with lush growth of cocklebur. 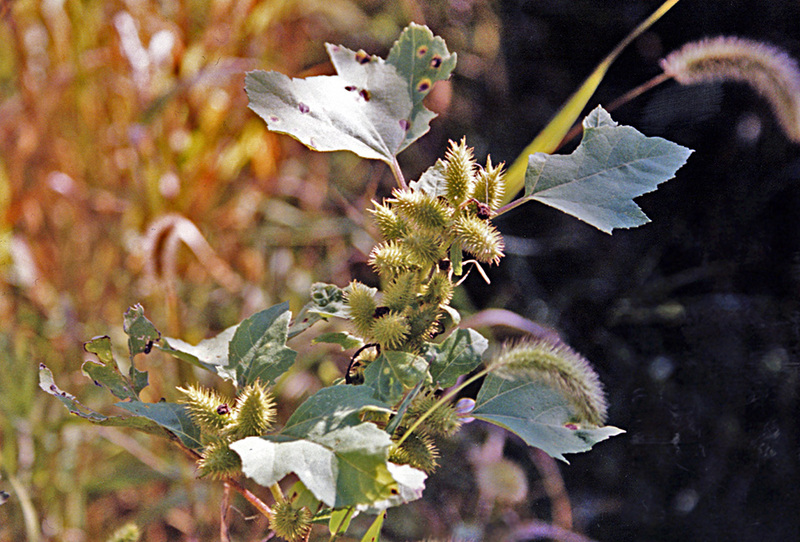 The burs can float and are well suited for dispersement along waterways, but are mainly suited for dispersement by attachment to mammal fur. 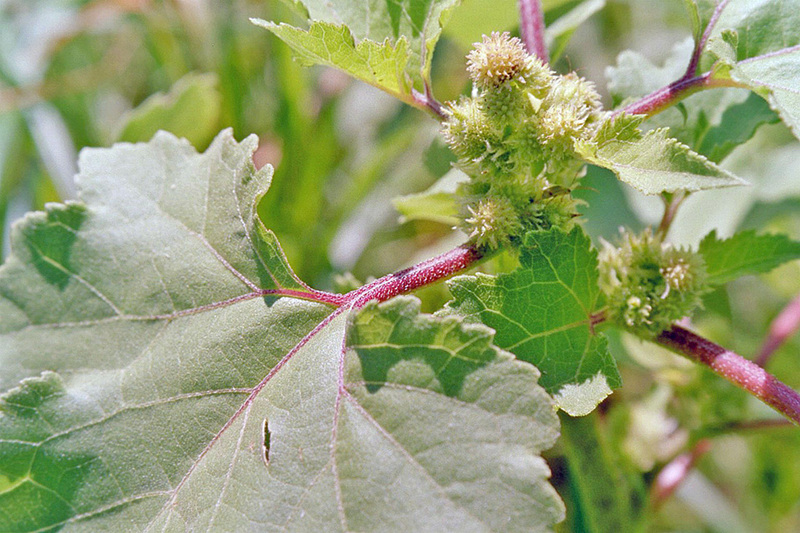 It's our Weed of the Week, Cocklebur.